The Cook Saddle Cafe & Saloon opened for business Labour weekend 1993, owned and operated by Patsy and Ken Domonkas. They renovated what used to be a butcher shop and souvenir store into a unique Tex Mex style (with a west coast influence) restaurant and public bar. The building was sold to the current owners October 2001. Now it's 100% locally owned and managed by the Scott's from Karangarua. Being one of the first few family’s to reside in this area, they were originally known for there fine heroford stock then for breeding horses. 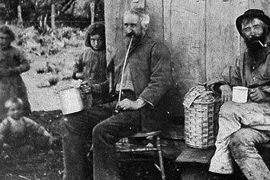 The descendants of these family's still farm and live at Karangarua. With the increasing demand from tourism there was renovations to increase the seating capacity and kitchen which happened winter 2002. The walls are covered in local memorabilia, black & white photos of people who helped create this wonderful part of the Westcoast. People love to wander round looking and the antique replica, check out the pictures and read the captions to get a real feel for our local history. One of New Zealand's greatest explorers, well known locally for the Copland pass area, Charlie Douglas (left) drinking whiskey with Andrew Scott Snr, at Karangarua 1890's.